Cheam Windows are approved installers of Origin Bifolding Doors in Surrey and the Home Counties. The Origin bi-folding door remains the market leading aluminium bi-folding door product available today. Not only is it carefully designed and manufactured in Britain, but it comes with a host of features and an after care package to ensure customer peace of mind for many years to come. With many bi-folding doors available on the market, how can you be sure you are getting the best product available today? So what are the advantages of the Origin Bifolding Door? Industry Leading 20 year Guarantee. Origin bifolding doors in Surrey are supplied by Cheam Windows and are the only bi-folding door product available that is comes with a comprehensive 20 year guarantee. Exclusive to Origin doors, every door is made with a unique serial number. 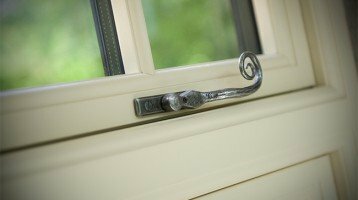 Cheam Windows are an Origin Approved Installer. This means we can offer a product with the longest guarantee available in the market today. Ultra light and smooth operation. Visit any of our showrooms and you will see our Origin bifolding doors installed. Here you will notice how light and smooth the operation of a large door is. Origin doors feature a new glide system with many benefits. Bifolding doors are widely accepted by experts to be better with the bottom of the door is taking all the weight. This is a much better and more reliable door system than other bi-folding doors that “hang” from the top. Origin bi-folding doors use a special long wheel base for the rollers as well as the best quality hard nylon to ensure each door glides smoothly with hardly any effort. Your bi-folding door will in most cases be installed at the back of your home. With many gardens being private and not overlooked, you will be looking for a bi-folding door that comes with the best security. Our doors feature an 8 point locking system designed specifically for the door itself and not using industry standard components. You will find 20mm bolts as part of the multi point locking system. Yale cylinders are also provided. The Yale name is synonymous with high security and trust. The hook bolts on the main locks also benefit from being 25mm deep making them the deepest hook bolt you can buy. This multi point locking system also includes bolts at the top and bottom of the doors. This not only keeps the doors very secure but also keeps them tight for the best possible weather resistance. With so many bi-folding doors being a feature of family living, our Origin Doors are provided as standard with special gaskets between each door made to be finger safe. The lead door is provided with a strong magnet that will keep the door in place to prevent slamming. Our doors also feature a low and flush threshold that will blend well with internal floor finishes and outside slabs or decking. If you care about the performance of you bifolding doors, ours can exceed the current building rules when used with the correct glass. Our doors also come with the latest “thermal break” technology that further enhances the thermal performance of the doors. When your origin bifolding door is installed and registered for its guarantee Cheam Windows will also provide you with an after care package that gives you more information on how to look after your bi-folding doors. We can help you enhance them with lovely blinds, additional features as well as a range of lifestyle offers and vouchers to help you get the most from your new doors. Contact us for further information about the market leading bi-folding doors available today. Bi-fold doors are the lifestyle product of today. A bi-folding door is one way of bringing a truly new element to your home. They also increase the value of a home and hold huge appeal to future buyers. Let Cheam Windows advise you on Bi-fold Doors and your new extension. 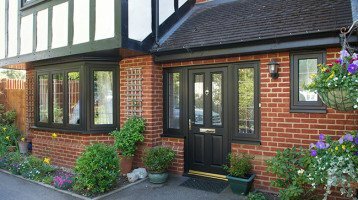 Cheam Windows will assist you in thinking about the function of your extension right before you start. We will help you add the features and above all the correct door design before you start. Whether your bi-folding doors are for a new kitchen, a living room extension, study or playroom, we have a product and advice to suit you. Visit one of our showrooms in Hampton Court, Worcester Park and our new flagship showroom in Banstead Village High Street to see the bi-folding doors installed. Other companies may simply install a bi-folding door in a temporary frame. Cheam Windows install their doors in accurate “real life” displays. At any of our showrooms you can see how your bi-folding doors will be installed, finished off and of course the vital relationship between your internal floor levels and your external decking or slabs. You can also try out the product to see how the Cheam Bi-folding Doors operate with ease. Including as standard finger safe gaskets, ultra high security locking, quality of manufacture and industry leading guarantee of 20 years. Whatever door you are looking for or whatever the nature of your window or door needs, visit our showrooms so you can see and try the product. Bi-folding doors are one product where the “traditional” hand samples of other window companies simply won’t do. Cheam Windows are experts in bifolding doors – talk to us please. If you are building an extension and hiring an architect, Cheam Windows will work with your architect on the technical aspects of the product and together we will work to provide the concept and products you require.